引用格式：陈香嵩, 李甜甜, 周少立, 赵毓. (2018). 外源蛋白在烟草叶片瞬时表达. Bio-101: e1010127. DOI: 10.21769/BioProtoc.1010127. How to cite: Chen, X. S., Li, T. T., Zhou, S. L. and Zhao, Y. (2018). 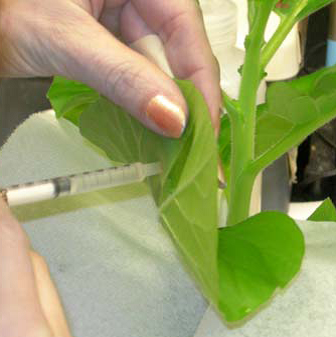 Transient Expression of Exogenous Protein in Tobacco Leaves. Bio-101: e1010127. DOI: 10.21769/BioProtoc.1010127. Voinnet, O., Rivas, S., Mestre, P. and Baulcombe, D. (2003). An enhanced transient expression system in plants based on suppression of gene silencing by the p19 protein of tomato bushy stunt virus. Plant J 33(5): 949-956. Copyright: © 2018 The Authors; exclusive licensee Bio-protocol LLC. You are highly recommended to post your data (images or even videos) for the troubleshooting. For uploading videos, you may need a Google account because Bio-protocol uses YouTube to host videos.